Vietnam has a very rich diversity of musical styles, due in part to it’s geography, ethnic groups and the fact that it blends Chinese, as well as Southeast Asian musical influences. Here’s an example of ca hue from the same Victor series as our last posting. Ca hue is a type of composed music that dates back to the 1500’s when Hue, in central Vietnam, became a cultural center independent of Hanoi in the north. The singer plays a wooden clapper and the ensemble usually consists of the “five excellent instruments”; dan tranh (zither), dan nhi (2 string fiddle), dan nguyet (2 string lute), dan day (3 string lute) and ty ba (pear shaped lute), sometimes a flute replaces one of the lutes. 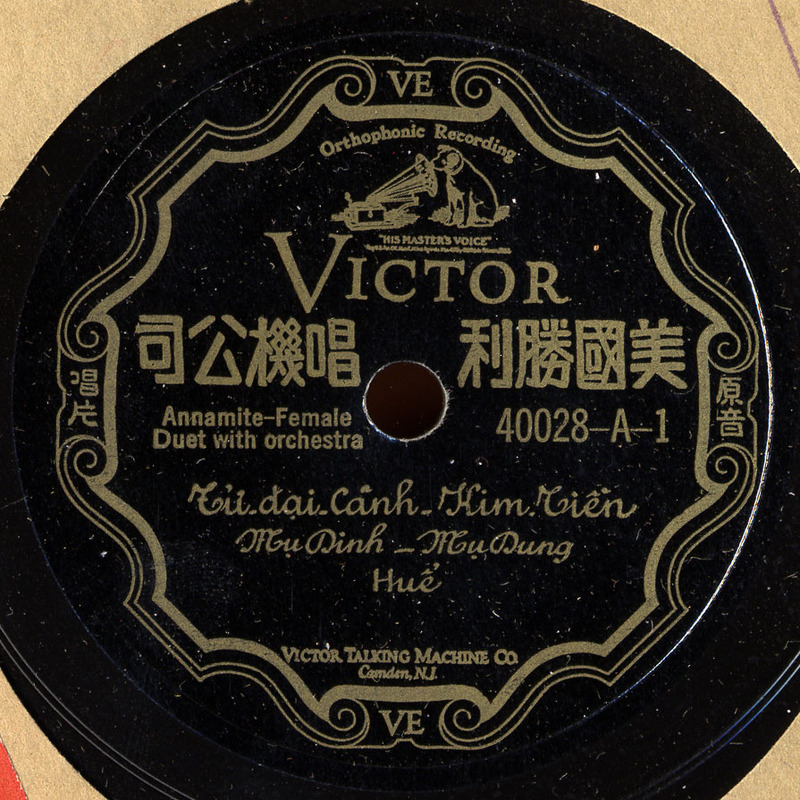 This song is called Tu Dai Canh and is one of the standard pieces of ca hue repertoire. Thanks again to Terry Miller for label translation and musical info. Some information on ca hue came on from Phong Nguyen’s article on Vietnamese music in the indispensable Garland Handbook of Southeast Asian Music, edited by Terry Miller and Sean Williams.